The game between Permian High School and cross town rival and older brother Odessa High School is always a classic game. Even when it has no playoff implications, even in the years when the Odessa High Bronchos had few games in the win column and the Permian Panthers were making their annual deep run into the Texas High School playoffs, it was always a good hard fought game and always a standing room only sellout in a stadium that held at least 20,000 fans. I was there for many of these epic battles, first as a student of Odessa High and later as a fan. I was there the year the game was called on Friday night because of deep snow and played on Saturday in deep snow. Odessa lost. I was there in 1973 when Odessa lost with a questionable call by the officials as the game ended. So questionable was the call that few fans on either side cheered. Odessa High beat Permian in 1964. It was a good year. Larry Gatlin, later a star country singer was the quarterback. All was well in Broncho land. For the next 32 years the Odessa High Bronchos lost this game. In those 32 years the Permian Panthers, known as "MOJO" after 1968, fielded some great teams, won several state championships and became known worldwide because of the book and later the movie "Friday Night Lights". The date for the 1997 game was set for Friday, September 26th at 7:30 PM in Ratliff Stadium. The Bronchos were the home team that year. There was excitement in the air that this could be the year! I had heard this many times before. On Wednesday night preceding the game the line began to form in front of the Ratliff Stadium Ticket office. Hardy souls from the fan base of both Odessa High and Permian High camped out for the cause. To get one of the 7 or 8 thousand tickets still available. Before the gates opened for the game, it was a sellout. My brother had a ticket for me. He was a long time Odessa High season ticket holder, but I lived 600 miles away in Houston. I had seen them lose many times but even so, the atmosphere and spectacle of a sellout game at Ratliff Stadium between these two teams was indescribable. So indescribable that an aerial video of a sellout Odessa High, Permian High game was used in the movie, Friday Night Lights. It was that event that sold the directors on shooting the movie in Odessa at Ratliff Stadium. On that September evening as the Friday night lights came on I was sitting at my computer in Houston. Radio broadcast of High School football games on the Internet were unheard of in 1997 but Texas High Football websites were beginning to flourish. One of the early web masters of football websites was a Permian fan named Alan Kyle. He had made some great websites for all the teams in the 3-5A district, a West Texas district known as the "Little Southwest Conference" it included, Abilene High, Abilene Cooper, Midland High, Midland Lee, Odessa High and Permian High. On this night he decided to open a chat room and type in the play by play of the game. A yeoman task, he did well. From passes, runs, flags and first downs he type it all out to a chat room crowd that on several occasions top 800 participants from around the world, mostly former Odessans who over the years had spread around the country or, in the case of many involved in oil discovery and production, around the world. They all had one thing in common, the game. Alan did great job on the play by play, he rested during the half time as the far flung fans chatted about the game. The final score was the Odessa Bronchos 20, the Permian Panthers 17. This broke the 32 year losing streak against the Permian Panthers. It had to be the most exciting game I didn't attend. Several weeks later I was in Odessa and my brother gave me my ticket and said, "You should have been there!" He was right, I should have been there, but I enjoyed it anyway and I have an unused ticket to the game, with the stub still attached. Ever Fall in Texas literally thousands of High School students play UIL sanctioned football. They work, they sweat, they struggle to win that elusive Friday night icon and put one in the win column. The truth is most players never go to the first level of the playoffs. Texas high school football is real, and it's played by athletes that play for the love of the game. There is an old axiom in High School Football. Any team can beat any other team on any given Friday night. This game was a good example. Midland Lee, two time 5A Texas State Champion, rank #4 in the state polls and ranked in the top 10 in the USA Today poll was defeated by the 30 point underdog Odessa High Bronchos. They're wining strategy? Contain Cedric Benson. Cedric Benson is a name you will hear again. He was the first High School player ever on the cover of Dave Campbell's "Texas Football Magazine". Contain they did. At the half Midland took a 14 - 13 lead into the locker room. The Bronchos held tough. Final score 27 - 17, Odessa wins. 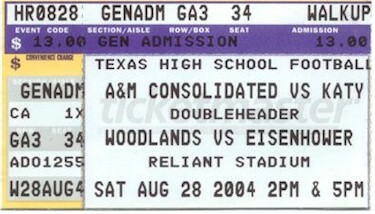 Post Script: Midland Lee went on to win the 2000 5A Division 1 State Championship.